I spent the first two weeks of April participating in an intense training challenge for bloggers through the Inspired Bloggers University. I gained so much valuable information through this free training that it was almost too difficult to digest it all! You may not be interested in blogging, but whatever you want to learn, there are free resources out there. Some of my favorite free training has been YouTube videos about auto or home repairs. I’ve saved so much money just by learning how to fix something from a video! I will write a post soon about the variety of free training available. Unfortunately, our string of bad health luck has continued. BOTH of my kids came down with strep throat last month. For those who have dealt with strep, you know that it’s not something you can wait a few days to treat. It is absolutely miserable and can lead to more serious illnesses if left untreated. We realized my son had it right after the pediatrician’s Saturday morning hours ended. Since we couldn’t wait for them to re-open Monday, we headed to the Kroger Little Clinic. Why did we go there instead of urgent care? While either one could have treated him, my co-pay at the Kroger Little Clinic is only $20. At urgent care, I’m charged a copay of $50. The emergency room would have been a $200 copay! Many of the clinic-type healthcare locations are staffed by nurse practitioners and are open much longer hours than a typical primary care office. They are perfect for things that are urgent but not life-threatening like strep throat, UTIs, and ear infections. They can treat these types of illnesses on the weekends or in the evening, and if you have a copay, you’ll be charged the same as a primary care doctor’s office. I also love the convenience of being to reserve a spot in line from The Little Clinic web site. I didn’t have to wait at all once I arrived with my sick little guy. After being stuck at home for way too long with my bad foot, I was feeling a little lonely. To solve the problem, I randomly invited some friends over for dinner at the last minute. It’s not something I would normally do, but I was inspired by this post about how to host a crappy dinner party. It was actually our dog’s birthday, so we used that as an excuse for our party. It was a lot of fun and something I’d like to do more often. Since I didn’t do any special preparations, it didn’t really cost me anything except a small amount of food. It was definitely worth it to life my spirits! My dog is not a breed that requires frequent haircuts, but all dogs need at least baths and nail trims. I’ve always handled dog grooming myself. As long as the dog isn’t aggressive, keeping a dog groomed is probably easier than keeping kids clean! For the summer, I gave my dog a bit of a haircut to make it easier to clean him. He may look fancy, but he LOVES to roll in mud, poop, dead animals, and anything else that smells good to him! I also trimmed his nails, which isn’t too hard after you get the hang of it. After trying a variety of different dog nail clippers, these are my favorite. They also come in small or large, depending on the size of your dog. 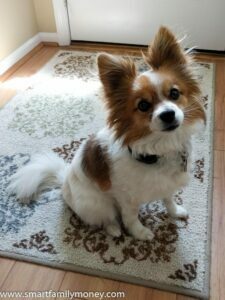 Perry the Papillon, showing off his summer haircut and trimmed nails. My health insurance offers rewards in the form of gift cards for doing healthy things like getting a check-up. I received $75 in gift cards through this program last month and redeemed them for movie theater gift cards. My family was able to enjoy a family day at the movies for free (with some leftover for a date night!). We saw Beauty and the Beast together and had a nice time. 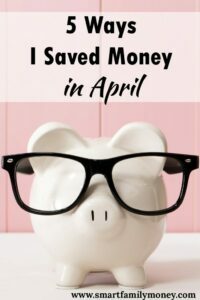 How did you save money in April? I’d love to hear in the comments below! If you want more ideas, check out other posts in this series for more money saving ideas.